Doubs is a department in the Franche-Comté region of eastern France named after the Doubs River. The department, which borders Switzerland, is dominated by the Jura Mountains, which rise east of Doub’s capital Besançon. An area of mountains, woods, plateaus, lakes, waterfalls and pastures and renowned for its natural beauty – you won’t be disappointed when you rent a self catering holiday home in Doubs, France. The Doubs valley is worth visiting for its caves and stunning waterfalls with the Vallee de la Loue known for top-quality water sports - well worth a visit whilst staying in a Doubs holiday rental cottage or house. Besançon is the principal city of the department and also the region of Franche-Comté. Once proclaimed France’s first green city of France, Besançon has been labelled a 'City of Art and History' since 1986, and has been on the UNESCO world heritage list since 2008. The city sits within an oxbow of the Doubs River. 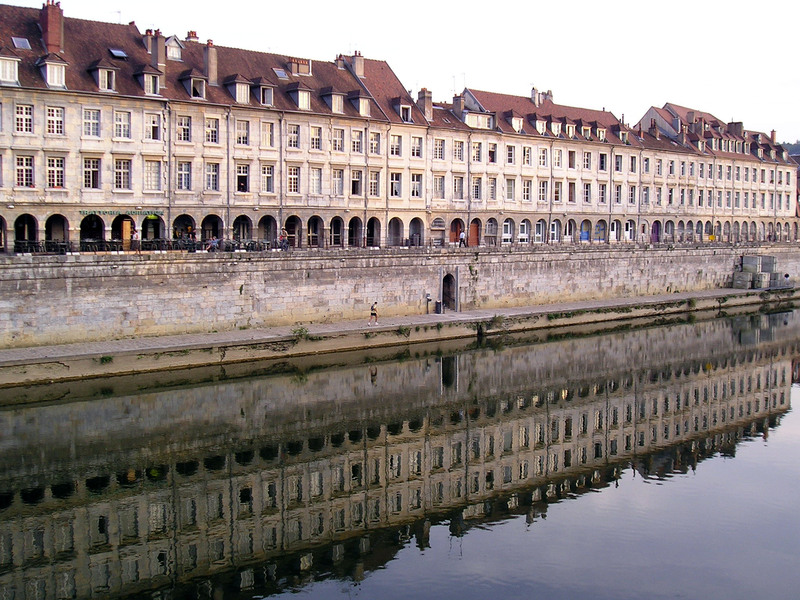 Besançon has one of the most stunning historic centres of any major town in France. When you holiday in Doubs marvel at the classic stone buildings, some dating back to the Middle Ages and others to the Spanish Renaissance. Among the most visited historic monuments are: the 16th century Palais Granvelle, Vauban's citadel (Citadel of Besançon), the Cathedral of St. Jean, and the Musee du temps which tells the story of Besancon's watch and clock making industry. Take a self catering holiday rental property in Doubs and explore The Fort de Joux or Château de Joux, a castle transformed into a fort, located in La Cluse-et-Mijouxin the Jura Mountains. It commands the mountain pass "Cluse de Pontarlier". The fortress currently houses a museum of arms dating from the early 18th to the 20th centuries. The castle also has a well which, at 120 m, is one of the deepest in Europe. The Château de Montbéliard is a fortress located on an outcropping rock that surveys the town of the same name. The city of Pontarlier is briefly mentioned in Victor Hugo's Les Misérables and was famous for the production of absinthe until its ban in 1915. The distilleries switched over to producing pastis however they are today are once again producing absinthe. By air: Unusually for a town of its size, Besançon does not have a commercial airport, though two international airports, EuroAirport Basel-Mulhouse-Freiburg and Lyon Saint-Exupéry International Airport, can be reached in about 2 hours. Both airports are well-served by the low-cost airline industry operating flights from all over the UK. By Rail: Besançon has direct high-speed train (TGV) links with Paris, Charles de Gaulle Airport, and Lille from its Gare de Besançon-Viotte. By road: The department is situated at the crossing of two major lines of communication, the NE-SW route, following the valley of the river Doubs, and linking Germany and North Europe with Lyon and southwest Europe, and the N-S route linking northern France and the Netherlands with Switzerland.